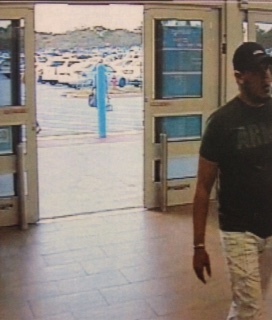 (February 20, 2015)- Cape Coral Police are asking for your help identifying a credit card fraud suspect. On December 30, 2014, between 5:20 PM and 6:05 PM, a suspect described as a white or Hispanic male used a cloned credit card to make several purchases in the amount of $727.68 at the Neighborhood Wal-Mart located at 505 S.W. Pine Island Road, and the Super Wal-Mart located at 1619 Del Prado Blvd. South.